Discussion in 'Pin Showroom' started by IrvineLotus, Feb 18, 2017. Those are really pretty. I think, for me, it would depend on how pricey the printed canvas was before I would be bold enough to poke holes through it. 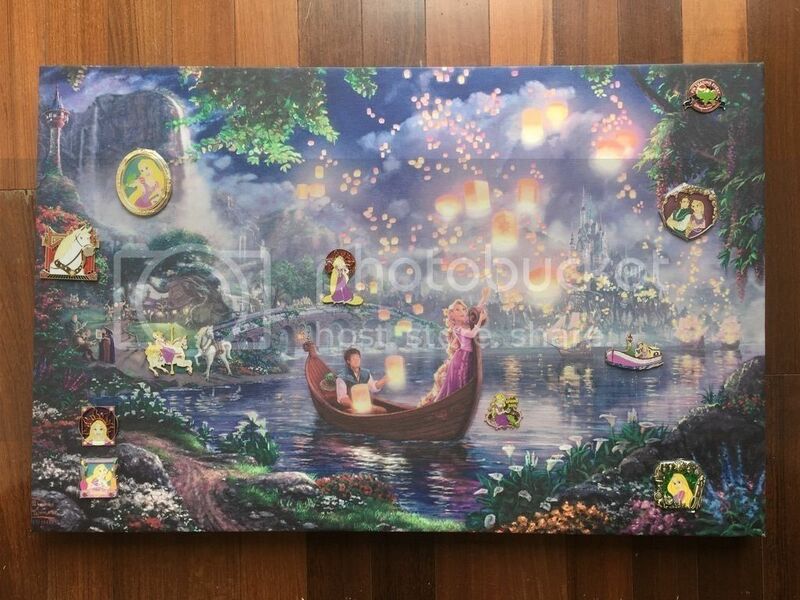 It costs $20-30 to buy a printed canvas from Amazon or eBay. Or you may print your own from Costco or Walmart. I stretched it with material under $10. There are numerous instructions on Youtube on stretching a canvas. They are all lovely, but I really like the Tangled one. The pins just pop out at you. LOVE this idea. How large (or small) are your canvases? I bought the largest size I could find -- approximately 35"x23.6". Minus 1.5" on each side to fold onto the frame as side faces. It's pretty big and has space for future pin expansions. Very pretty - great idea! Do you add any padding or something to stiffen the canvas and give the heavier pins extra support so that they don't sag or pull on the canvas? The canvas is pretty thick and tight after being stretched. Most heavy pins has two or more posts anyway. You can always add paddings as you want, or even replace the canvas if it sags in a few years. I have two open edition Ariel in green dress pins of the same design -- left and middle ones. Is the left one a scrapper or just from early years with old manufacturing techniques? I think different manufacturing years. There's a new image that I would like so much for my BATB pins. Wow those are beautiful displays! The one on the left is a fake pin. The pin never looked like that since it's been released. Very, very nice!! Wish I would've thought of that before doing shadow boxes!